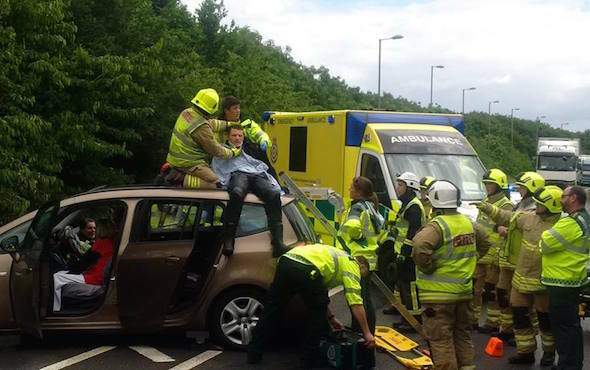 A young motorcyclist had an incredible escape from injury after colliding with a car, and crash landing onto its roof. The rider was legally filtering through traffic on the A41 near Bicester at midday yesterday when he struck the rear right-hand wing of a Ford S-Max. 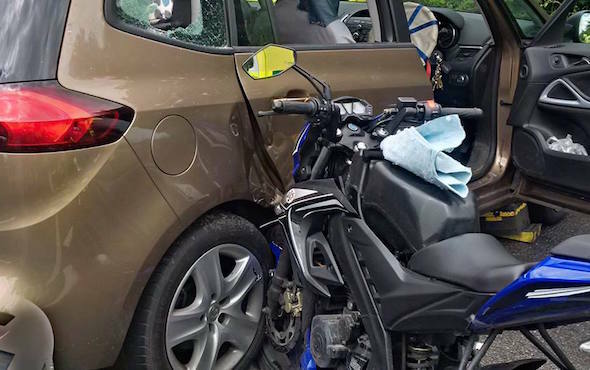 The front wheel of his AJS TN12 125cc motorcycle became jammed in the wheel arch of the car, while the learner rider was flung into the side of the car, and then catapulted into the air. Amazingly he appeared to complete a full somersault, before landing on the roof in a seated position, with his legs dangling over the opposite side of the vehicle. Such was the force of the collision, that the motorcycle – which costs £1900 new – remained wedged upright afterwards. 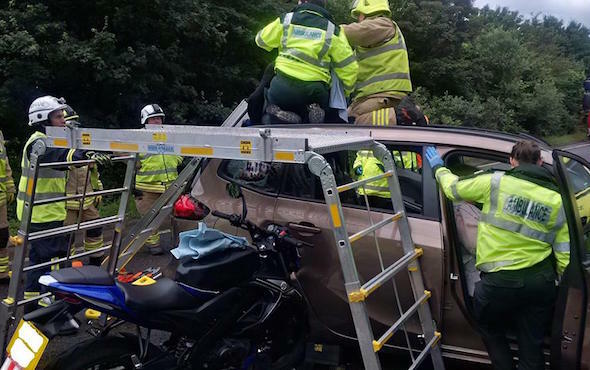 Oxfordshire Fire and Rescue Service attended the scene at 12:30pm, before paramedics climbed onto the car to stabilise the biker, who was remarkably uninjured. He was taken to the nearby John Radcliffe Hospital as a precaution. Speaking after the incident, station manager of the Oxfordshire Fire and Rescue Service, Mick Clarke, said: "This was one of the most extraordinary incidents I have seen in my 20 years of service. "The motorbike quite literally wedged itself between the rear wheel and the passenger door of the car. "It seems like his chest has then hit the top rear of the passenger door with some force, as it has left a dent in the roof, then he has somersaulted up and over the car, landing in a seated position on the roof with his feet over the other side of the car. "To the rider's credit, he was wearing all the correct protective equipment and additional body armour that no doubt saved him from serious injury."